The General Surgery department has been functional in the hospital since its inception in the year 1985 and handles a wide spectrum of elective and emergency surgical procedures. A highly specialized paediatric surgery unit provides expert diagnosis and treatment of congenital birth defects or other surgical disorders for children of all ages. all phases of care of the injured patient is an essential component of general surgery. All surgical procedures are carried out using the latest minimally invasive (laparoscopic) techniques or traditional open operative methods. 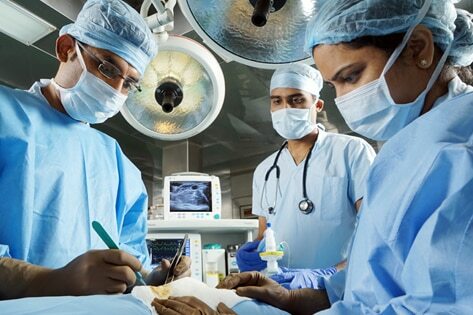 The state-of-the-art facilities available in the department is complemented by a dedicated team of highly qualified and experienced surgeons and other support staff to provide the best surgical care to our patients. Our surgeons focus on treating the whole patient and not the individual disease. Close coordination is maintained with the referring or specialty consultants of the hospital in the pre-operative evaluation and post-operative management of the patient. The General surgery department, with the support from other specialty departments such as Neurosurgery, Plastic surgery, Orthopaedics surgery, Anaesthesiology and the Accident & Emergency, ensure that the hospital provides excellent response to surgical emergencies round the clock.